Microsoft on Monday took its Xbox Music streaming service free for Web users and launched mobile apps for iOS and Android, with the move coming just before Apple is expected to release its own iTunes Radio service with iOS 7. With Xbox Music for iOS, Microsoft is looking to attract users to its Xbox Music Pass subscription service by offering six months of ad-free streaming, including access to content from a Web client and other devices. The app also allows existing Xbox Music Pass subscribers to listen on the go, curate playlists and create artist-based radio stations. As of today, customers can now access the service via iPhone, Android device, Xbox, Windows 8 PC or tablet and the Web. The app does not yet support offline listening, though Microsoft notes the feature will be available in a future update. Apple is also on the verge of releasing its own internet radio service with iTunes Radio for iOS 7. The upcoming service will tap into iTunes' vast catalog of content, with thousands of new songs added weekly, and is expected to be available on iOS, Mac, PC and Apple TV. iTunes Radio will be ad-supported with capped song skipping, though users can lift the limitations by subscribing to iTunes Match for $24.99 per year. The price is cheaper than some popular internet radio offerings, including Microsoft's Xbox Music Pass, which is available for $10 per month or $100 per year. 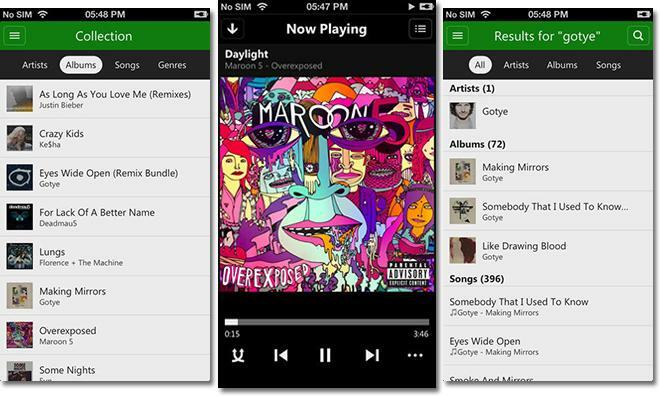 Xbox Music comes in at 8.8MB and is free to download from the App Store.